We are a small organisation founded and built by volunteers. We have a small staff team but so much of our legal support work is achieved by people volunteering their skills and experience. We are committed to ensuring that all volunteers are provided with support, feedback, training, and a safe and secure working environment. 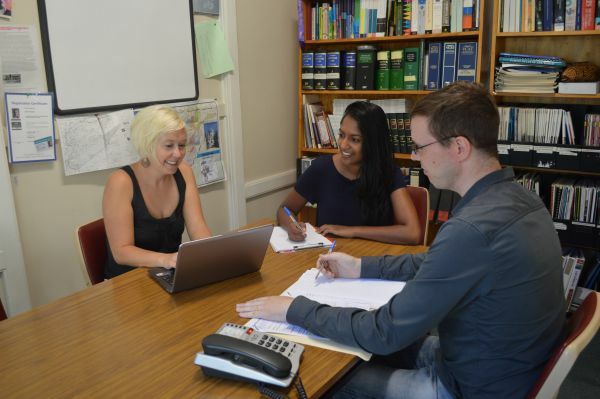 Volunteers at a community legal centre need good communication skills, an openness to diversity and other peoples' values, and a willingness to be challenged and to learn. We open to people from a diverse range of ages, work, education and life experiences. Patience, capacity to work unsupervised and preparedness to ask lots of questions! We actively encourage people from different cultural and linguistic backgrounds to apply who have enough English language skills to meet the requirements of the role. Para-legals, or people who have had some legal training or experience, or are current law students form the critical core of our volunteer teams. We directly assist solicitors with case work, taking instructions, interviewing clients, drafting letters, assisting in court, preparing legal briefs, making referrals and general casework assistance. It's busy but rewarding work. This specialist legal intake and referral role requires excellent communication and people skills and sound legal sector knowledge. We help the people who call or arrive at our centre seeking legal help find the best and most appropriate service for them. We book appointments, problem-solve, and keep the wheels of the busy centre turning! We have volunteer solicitors working with our day practice as well as on our Night Service fortnightly roster on Monday evenings from 6.00 to 7.30pm. We have secondee places available in our Police Accountability as well as our Generalist practice. Our Wills Clinic on Thursday mornings is run by a dedicated volunteer solicitor. We often require in-depth legal research done quickly and effectively for client case work or as part of a wider advocacy or law reform campaign. This area can involve drafting briefing notes on new legislation, writing explainers, web pages, articles or detailed reports to be published. We examine stats, interview clients, draw out case studies that confidentially tell our client stories to members of parliament.